An Olympus representative has said that he believes that compact cameras will survive, but only if they can offer something unusual, such as long zooms. Despite the apparently falling popularity in compact cameras, several key manufacturers have launched a wide range of new models at both CES and the CP+ show taking place this week in Japan. One of the key features that a lot of these cameras have in common is their long zoom capabilities. 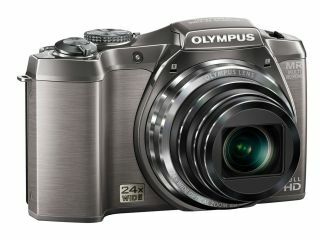 Olympus itself launched a SZ-31 zoom camera this week that features a massive 24x zoom. Speaking to TechRadar, Mark Thackara, Olympus UK marketing manager, said, "The concern for us is that we have to keep giving people a reason why they should have a camera as well as a phone." "That's all about zoom, and I can't see that changing. They will never fit a 24x [optical] zoom in a phone - and if they do, I'll eat my hat." Currently, mobile phones rely on digital zoom to increase their reach while there are also accessories for some, notably the iPhone, which allow extra lenses to be attached. Samsung experimented with the idea of an optical zoom camera phone back in 2006, and there has been the odd mobile pop up in Japan, but for now at least it looks like mobile manufacturers have given up on the idea. It does seem unlikely that phone companies will want to ruin the sleek exterior of pocket-friendly mobile phones, but with the introduction of the Polaroid "smart" camera that runs the Android operating system and houses a 3x optical zoom, perhaps we will begin to see some interesting hybrids appearing on the market. Until then, it seems increasingly likely that camera manufacturers will continue to play a game of "mine's bigger than yours" when it comes to zoom capability.